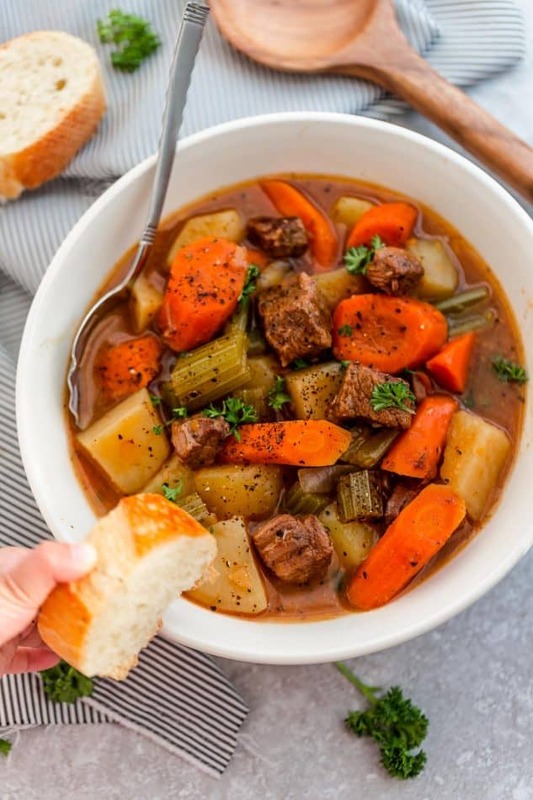 This easy Slow Cooker Beef stew is perfect for chilly days! 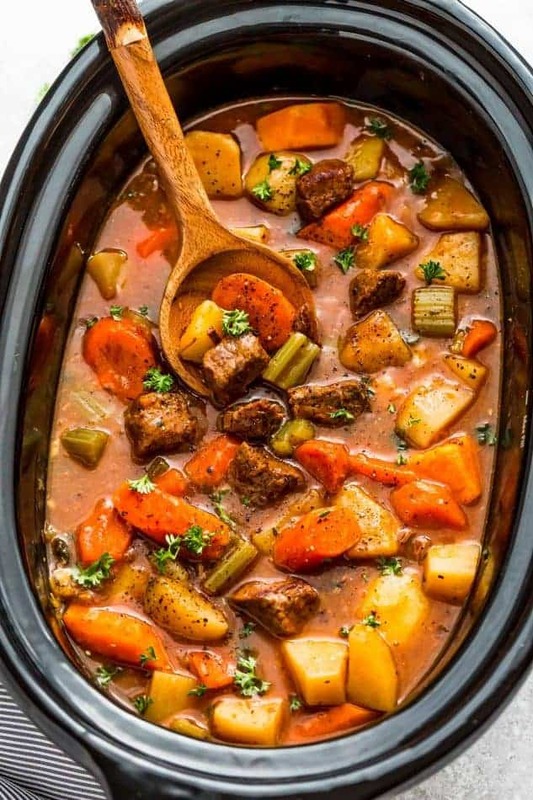 A delicious, old fashioned beef stew recipe simmered in the slow cooker with tender meat, carrots, potatoes and celery. Plus recipe video. There’s something about winter that makes all of us crave for hearty comfort food. My mom used to make a big ole pot of homemade beef stew for us on the weekends as soon as the weather got cooler. It was the ultimate cold weather food and we’d always go for seconds and thirds throughout the day. It was the best bowl of comforting goodness...especially if we went outside to play in the snow. Even now, it’s still one of my favorite lazy Sunday meals I make for my own family. 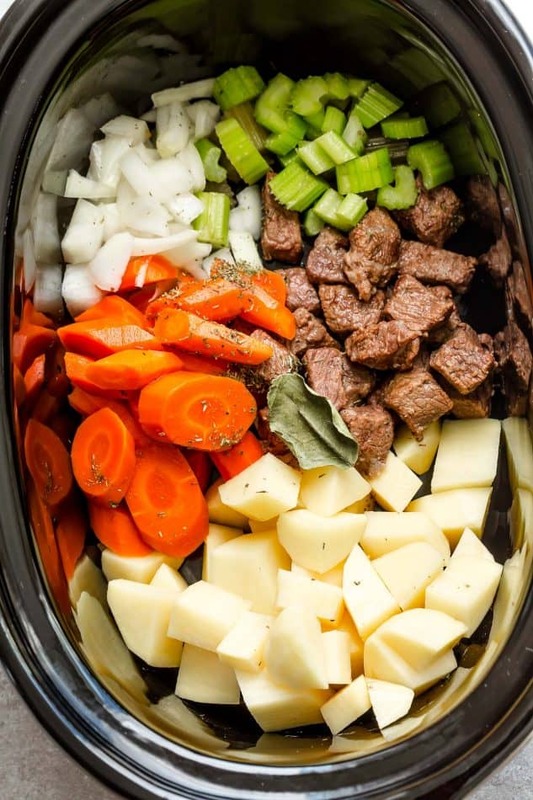 As much as I love quick and easy recipes, crock pot beef stew is still one of my favorite unbeatable ways. It takes hardly any effort and when you cook classic beef stew low and slow, it allows those deliciously deep and rich flavors to develop. The great thing about soups and stews is that you can customize them by adding whatever vegetables you prefer or have on hand. 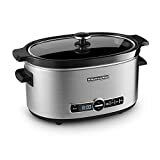 WHAT INGREDIENTS DO I NEED TO MAKE INSTANT POT BEEF STEW? Start off by combining flour, salt, pepper, onion powder, and seasoning. Add meat and shake until well coated. BROWNING THE MEAT:(FEEL FREE TO SKIP THIS STEP IN A PINCH BUT HIGHLY RECOMMENDED SINCE IT ADDS THAT EXTRA LAYER OF FLAVOR) – In a large skillet on medium high heat, add cooking oil and brown the meat on all sides. Meat will not be cooked through. (Be sure not to crowd the skillet – you may have to work in batches). Transfer browned meat into a large 6 quart slow cooker. Put the uncleaned skillet back on the stove and add onions and garlic. Saute for a minute or two then add the balsamic vinegar and tomato paste until just hot enough to deglaze the pan, about 1 minute. Pour into slow cooker over the beef. Add the potatoes, sweet potato, carrots, celery, Worcestershire sauce, Italian seasoning, bay leaf, beef broth, (star anise if using) and stir to combine. If there is not enough liquid to cover the vegetables, add water – only as much as needed. Cook on low for 5 to 7 hours or high for 3 to 4 hours (stir about half way through), until potatoes are tender and meat is cooked through. (Times may vary depending on how hot your slow cooker runs – check and cook longer or shorter if necessary). Adjust seasonings with salt and pepper if necessary (discard star anise if used). Serve hot with fresh parsley. Optional: To thicken stew: Make a slurry by whisking 2 tablespoons of flour (all purpose, cornstarch, gluten free flour or arrowroot powder) with 3 tablespoons of cool water. 20-30 minutes before serving, stir the slurry into the slow cooker, set to HIGH. Stew should thicken within 20-30 minutes. If it does not thicken, your slow cooker may not be hot enough so you will have to transfer to a large pot and heat on the stove if you want to thicken the stew. 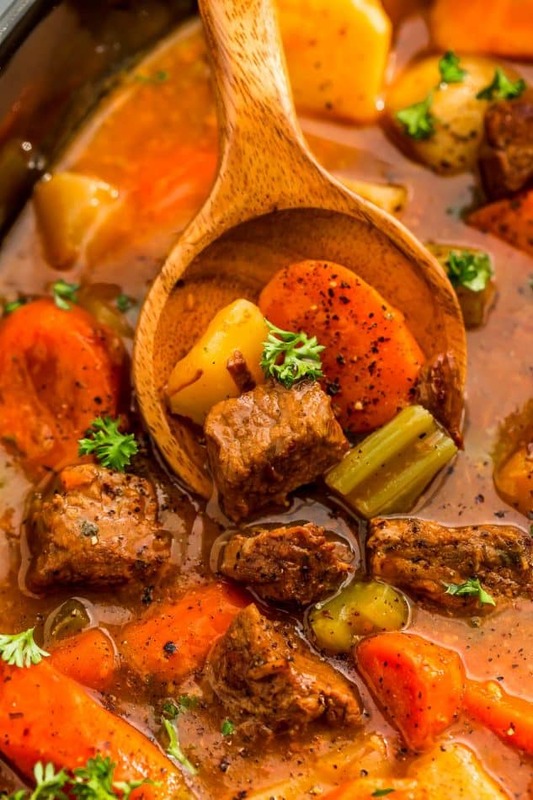 However, the stew will thicken up on its own overnight in the fridge even without the cornstarch slurry – the slurry is just a solution for immediate results. 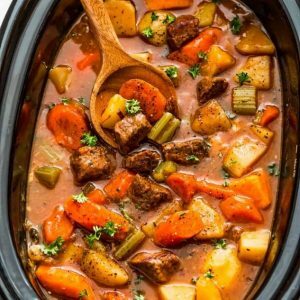 What is the best slow cooker for making beef stew? Be sure to use a large 6 quart slow cooker for this recipe. What vegetables do you use in beef stew? Be sure to use a combination of aromatics like onions and garlic plus vegetables. I used carrots, celery potatoes and a sweet potato. Feel free to leave that out if you’re not a sweet potato fan and you can also add some green peas or cauliflower if you like. What other key ingredients do I need to make the best beef stew? Add some tomato paste, Worcestershire sauce, balsamic vinegar and a star anise for a punch of flavor. If you can’t find a star anise or are not a fan, feel free to leave it out. peel and chop the potatoes and onions and store them in a zip-top freezer bag in the freezer. This prevents the potatoes from changing color and the onions from spreading odours in the fridge. cut the beef into chunks and place in zip-top freezer bags. Store in the fridge. This Slow Cooker Beef Stew recipe makes a big batch with enough for lots of leftovers. In fact, I think I love the flavors even more the next day. All those thick rich and deep flavors get a chance to build even more overnight. It’s jam-packed and loaded with fresh, real ingredients that are delicious and you can feel good about feeding it to your family and yourself. So delicious and the perfect meal for busy weeknights or a cozy Sunday dinner. BEEF STEW is the best comfort food! This old fashioned beef stew recipe is made in a slow cooker. For the beef In a large zip-top bag, combine flour, salt, pepper, onion powder and Italian seasoning. Add beef and shake until well coated. In a large skillet on medium high heat, add cooking oil and brown the meat on all sides. Meat will not be cooked through. (Be sure not to crowd the skillet - you may have to work in batches). Transfer browned meat into a large 6 quart slow cooker. Add the potatoes, sweet potato, carrots, celery, Worcestershire sauce, Italian seasoning, bay leaf, beef broth, (star anise if using) and stir to combine. If there is not enough liquid to cover the vegetables, add water - only as much as needed. Adjust seasonings with salt and pepper if necessary (discard star anise if used). Serve hot with fresh parsley. Optional: To thicken stew: Make a slurry by whisking 2 tablespoons of flour (all purpose, cornstarch, gluten free flour or arrowroot powder) with 3 tablespoons of cool water. 20-30 minutes before serving, stir the slurry into the slow cooker, set to HIGH. Stew should thicken within 20-30 minutes. If it does not thicken, your slow cooker may not be hot enough so you will have to transfer to a large pot and heat on the stove if you want to thicken the stew. However, the stew will thicken up on its own overnight in the fridge even without the cornstarch slurry - the slurry is just a solution for immediate results. Let cool, then store in refrigerator overnight or until ready to serve. This stew improves in flavor if made at least 1 day ahead. How delicious! Those carrot slices are beautifully sliced, Kelly. You just can’t beat a slow cooker meal when it is cold outside! Slow cooker has died. Is there one that you recommend. This is such an amazing stew, I’ve made this many times since buying the cookbook, I’ve thrown in many various veggies, whatever I have on hand and it never disappoints! So incredibly flavorful, I Love, Love, love this cookbook! 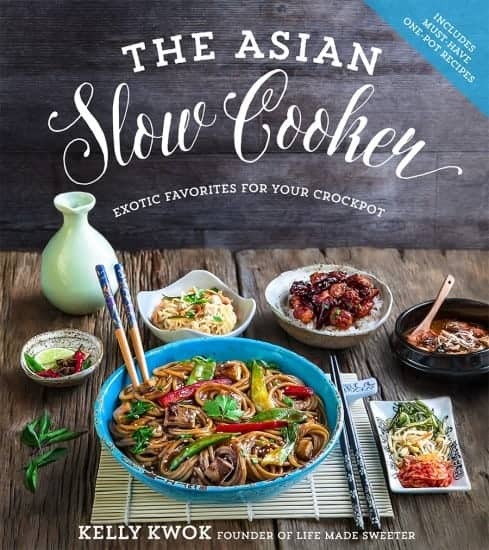 Too soon to ask for ‘The Asian slow cooker’ 2?? Please!! Hi. I was looking at your recipe for slow cooker beef stew, which looks really yummy, but notice you add a couple of ingredients twice, e.g. Italian Spice and Worcestershire Sauce. Is this a mistake? Please clarify. Can’t wait to make it. Hi Val, sorry about that. I just updated my recipe box plugin program and it seems to be acting a little bit glitchy adding things twice. I just updated it and the Italian seasoning is actually used twice – once for the beef and once to be added to the beef stew. The Worcestershire sauce should only be used once – 1-2 teaspoons, or to taste. Hope you enjoy. Thank you! 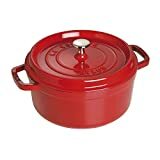 Hi Cheryl, either will work as long as you heat them at a low and gentle temperature (250-300 for oven) and (low-medium on stove) so the potatoes do not break apart and the stew heats evenly. If the stew is too thick, you can add a little bit of water or broth at a time until it reaches the consistency or thickness you like. Hope you enjoy. Thank you. I never used the slow cooker to reheat food… Have You??? Yes, you can definitely use your slow cooker on low as well 🙂 Enjoy! About that doubling of ingredients: for the beef, it lists flour twice? Ok or no? Hi Jeena, sorry, just fixed it – should only be once for the beef. Thanks! Hi! This looks delicious and just making it now. For making the slurry to thicken the recipe doesn’t say how many teaspoons of flour just how many teaspoons cool water. Trying to make slurry now and not sure how much flour to add. Thank you! Is there any way to make this without a crock Pot? Love this recipe! Accidentally bought pork cut as stew meat but it’s what I had for the recipe and so I used it and it was amazing! I also used roasted tomatoes out of my freezer, and it was a great sub for the tomato paste! i made this Last night and i cant wait to eat them for lunch today. Didnt have star aniSe so i skipped it. It smells so good!! If anyone has not tried this recipe yet do it!! It is delicious. I made it monday for a crowd. I am making it again today for home. if you can use the spices and herbs that make up italian seasoning fresh do so. it really enhances the flavor. the star anise really enhances it too. Absolutely delicious!! thank you for sharing this recipe. I don’t know why this is coming out all in caps. I am honestly not shouting at anyone.